As Boxing Day is typically a day of sales here in Canada, I decided to have a Boxing Day sale of my patterns, which can be found here. The patterns contain detailed instructions on piecing with lots of photographs and diagrams, cheat sheets with printing sizes, pressing instructions and quilting suggestions. The sale is on until 11:59 p.m. EST tonight and are available on the patterns page of my website. Baxter, of course, isn’t all that interested in patterns. He’s having much more fun watching things out on the roof garden. 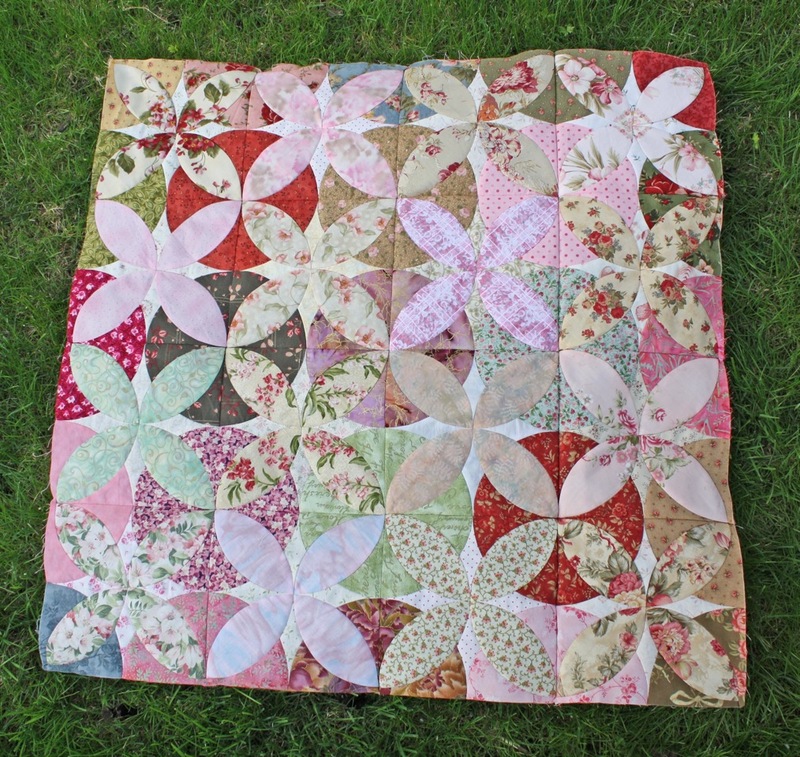 When I made one block last week, I really didn’t intend to make another right away but I couldn’t resist. They are fun to stitch. Doesn’t hurt that it means I’m working with my favourite shabby chic fabrics again and that this block has it all — curved piecing and continuous stitching. After pressing all the seams in one direction the block lies flat as can be and the back looks almost as good as the front. After what seems like a long cool and damp spring, we are in the midst of a mini heat wave. Yesterday was gorgeous and hot. Today the forecast is for a humidex reading somewhere in the high 30s or even as much as 40C. I’m not complaining after all those weeks of rainy cool weather. In fact, if we don’t get thunderstorms this afternoon, I plan to spend some time out on the roof garden soaking up the warmth. Smudge was quite content after his yogourt treat. Mr. Q.O. is working on the video of him drinking. As soon as it’s uploaded, I’ll post it. 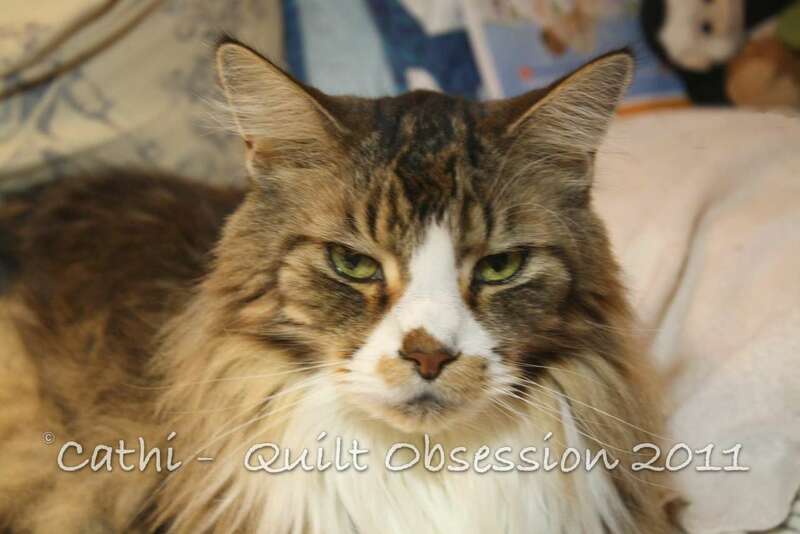 Once again, Amy is hosting the Bloggers’ Quilt Festival. 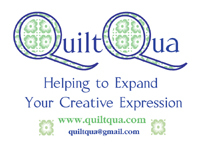 If you click on the button above, you’ll find thumbnail photos from the participants and, if it’s anything like the spring festival, you’re in for a real treat with lots and lots of lovely quilts to see and stories about their making to read. All this in the comfort of your own home! 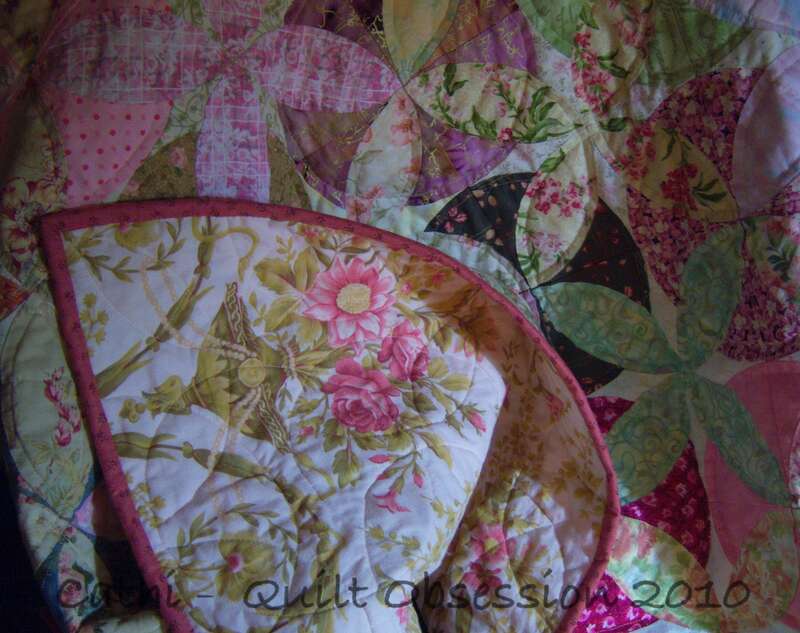 I debated showcasing Chintz Circles again so soon, but couldn’t resist it as my entry in the Quilt Festival. When the Inklingo Orange Peel Deluxe collection was released, I had played with the various designs and had a lot of fun doing so. One of my favourite variations was the Alabama Beauty block and, while I had only made one block of it, it stayed in my mind. 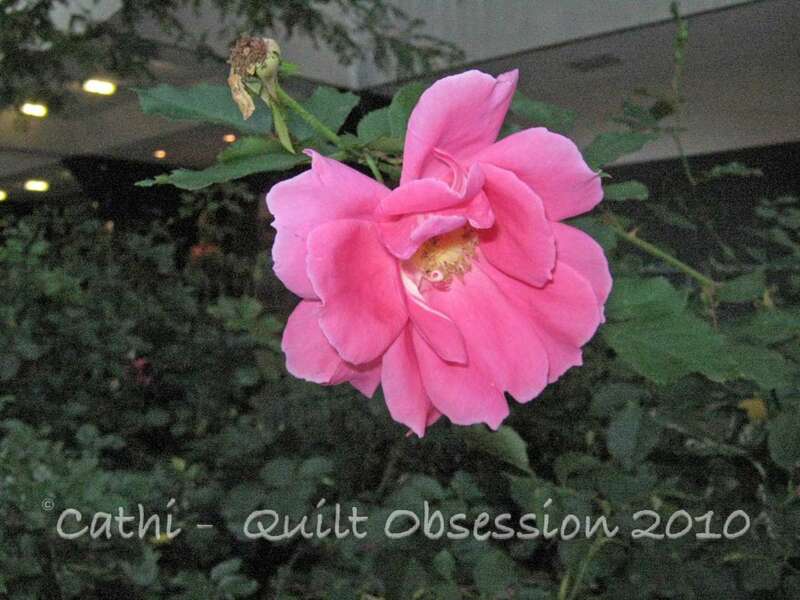 Eventually, the lure of that block, particularly with my aunt’s 90th birthday coming up, and making an Alabama Beauty quilt with shabby chic fabrics was irresistible. 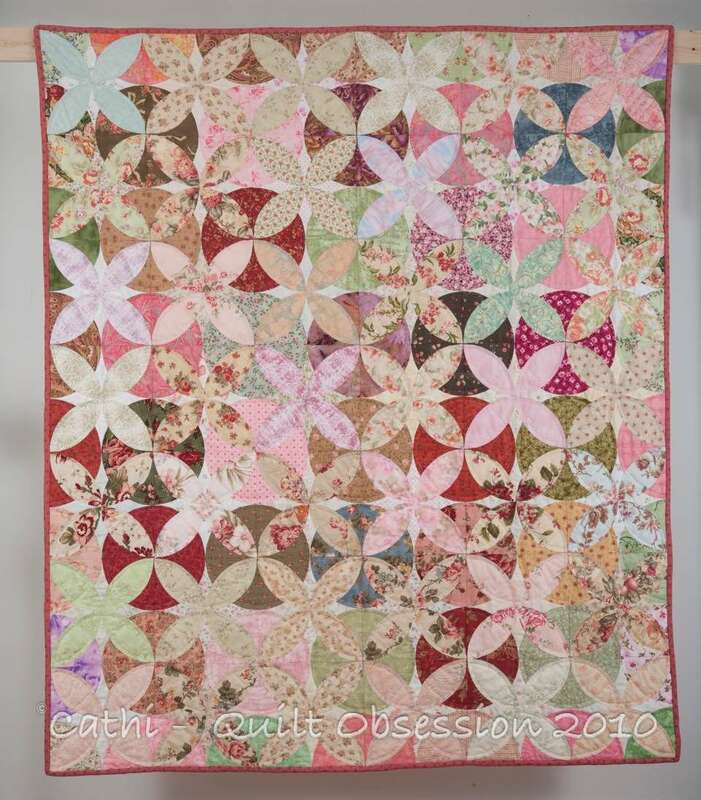 My aunt’s favourite colours are pinks and greens and I remember the chintz that was in her home when I was growing up so, as soon as I started making the quilt, I realized Chintz Circles was the perfect name for it. Karen Dianne was making Alabama Beauty blocks at the same time and had shown some of hers on a design wall. As soon as I saw that secondary circular pattern emerge, I knew exactly how I wanted to make my aunt’s quilt and I was off to the races. 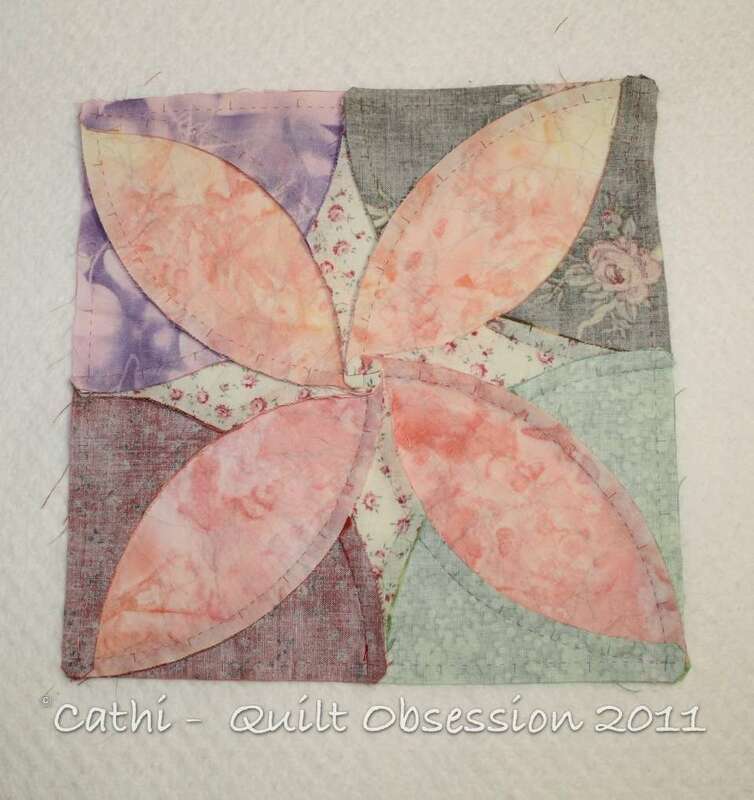 By mid-April I had hand pieced 6 blocks and saw the first two circles appear. Choosing the fabrics for each row became more complex as I had to be absolutely perfect with the placement of the fabrics that would emerge as circles. I developed a routine for doing that as I finished a row and would sort the fabrics for each block into separate envelopes. During the piecing, I was often thinking about the rousing games of double solitaire I used to play with my aunt at the cottage during the evenings. We would be laughing so loudly that my mother, who was invariably trying to listen to a baseball game on the radio, would leave and go listen to the baseball game out on the porch. I learned then that long nails, while looking good, were also a great deterrent to an opponent in double solitaire as I developed strategies to avoid getting stabbed by my aunt’s perfectly manicured nails as we competed to be the first to put a card up. 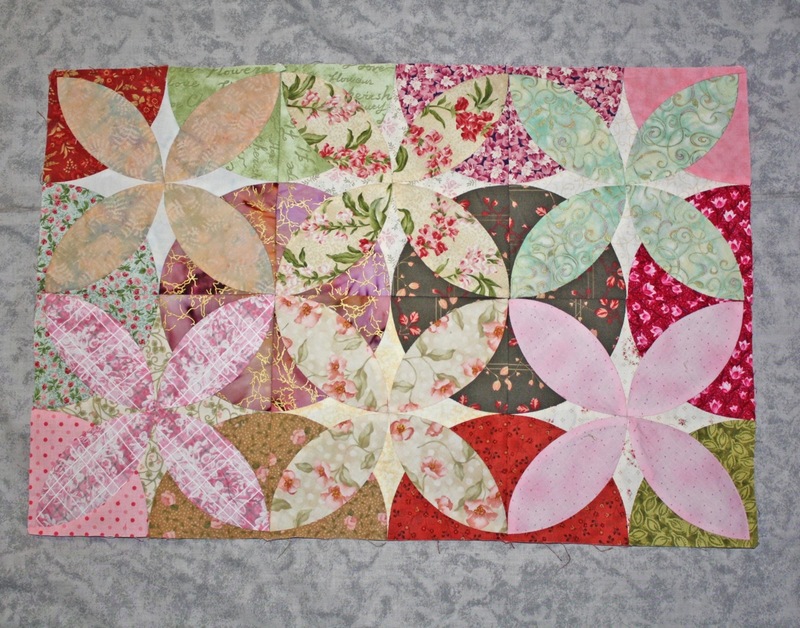 By April 21st, a total of 16 blocks had been pieced together and joined and 9 complete circles had appeared. 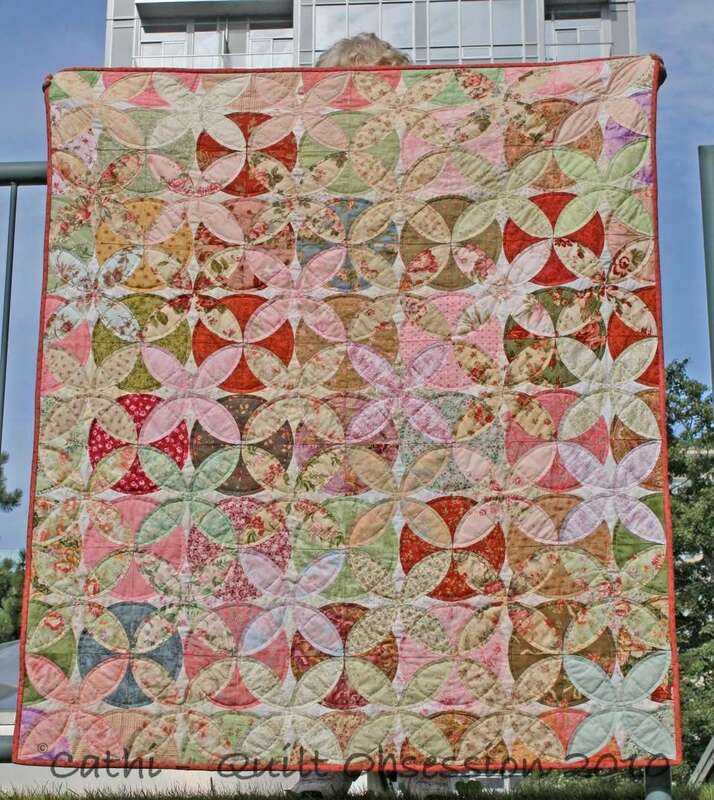 As the quilt top grew, it took longer to add more rows and see more circles appear but by May 18, there were 25 blocks joined and 16 circles had made their appearance. 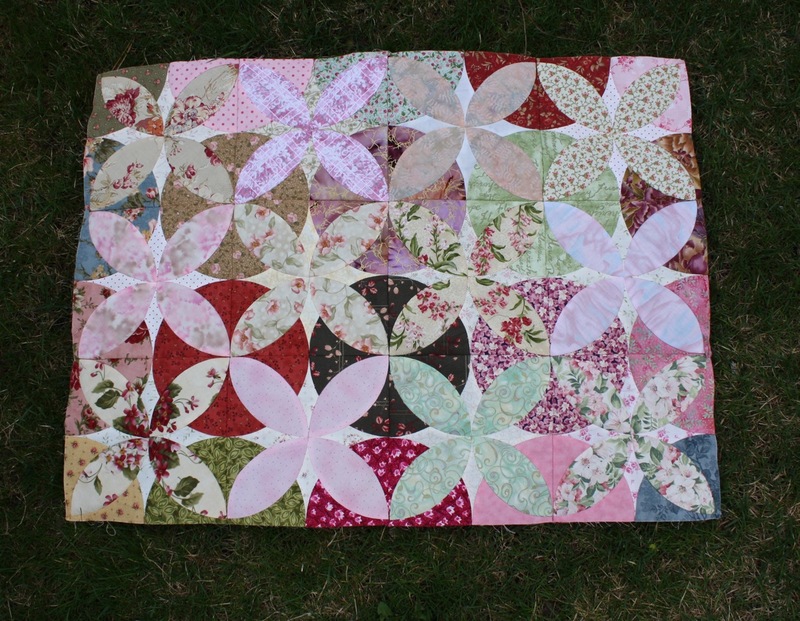 I was then in the home stretch and on June 21 a total of 42 blocks were joined, 30 circles had appeared and the hand piecing of the quilt top was complete. 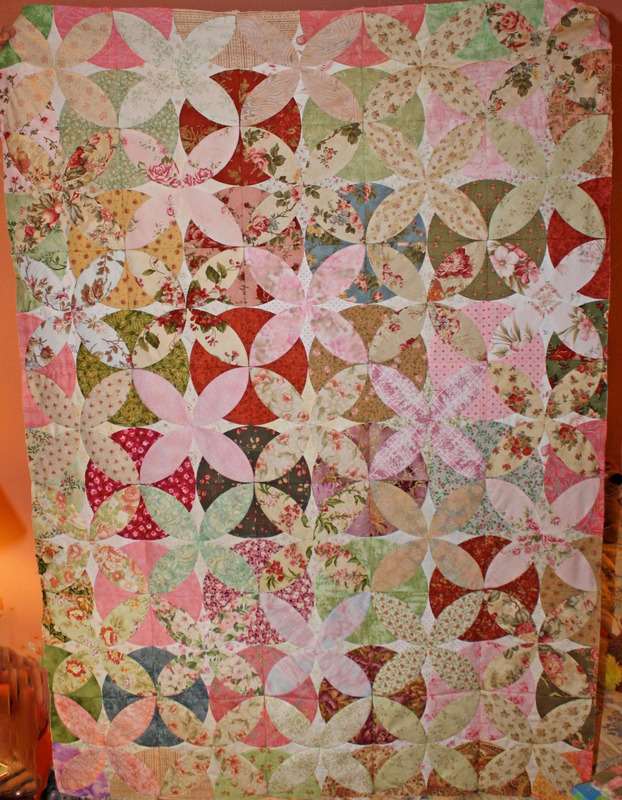 The backing fabric was found, the quilt was basted and the machine quilting began. 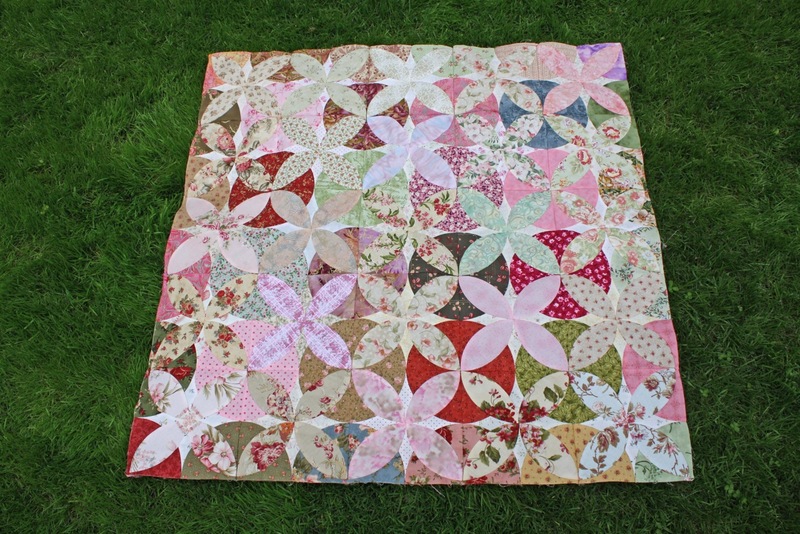 On July 20, the quilting was finished, the binding tacked down and this photo was taken very shortly after the last stitch was taken to attach the label. August 1 was my aunt’s 90th birthday. 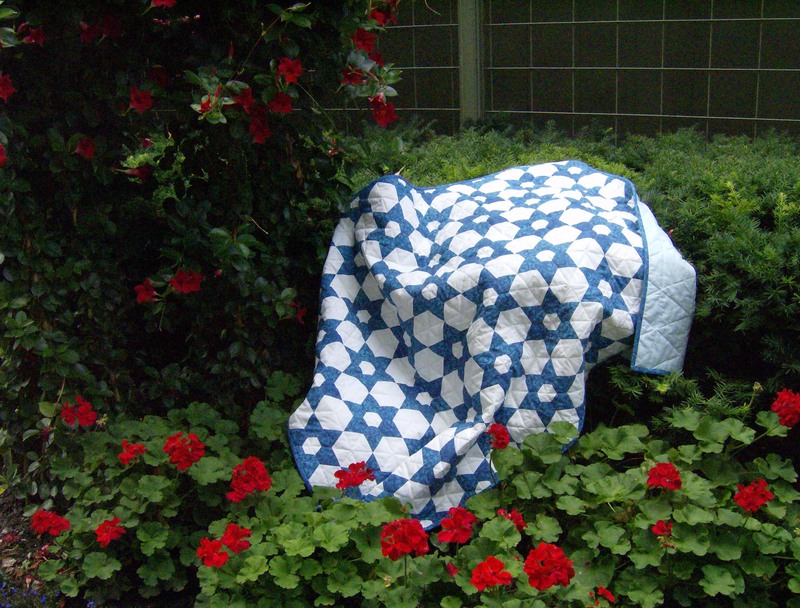 That morning I had washed and dried the quilt and it had that wonderful crinkly look that quilts get after being washed and dried. 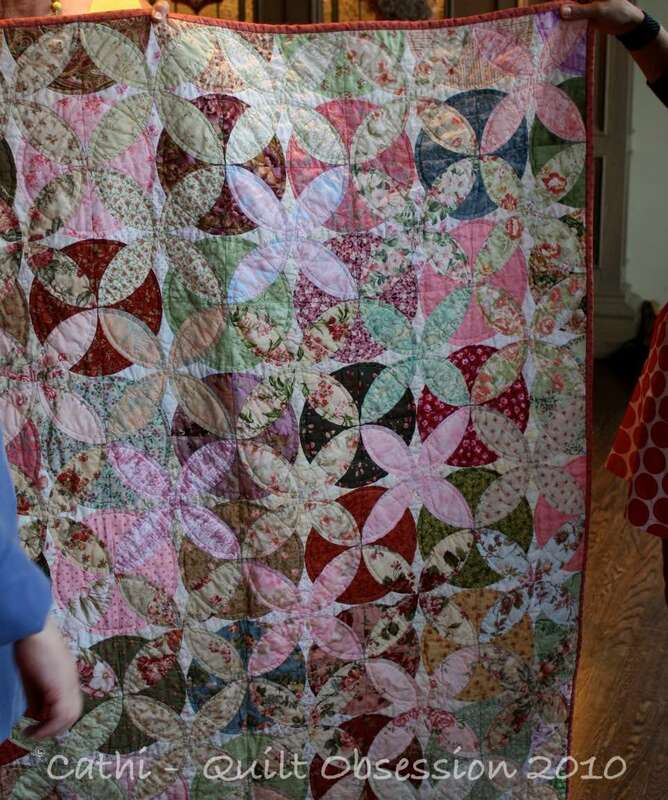 Then came the best part — when she opened the gift and saw her quilt. She still has those beautifully manicured nails I so remember from our double solitaire games! 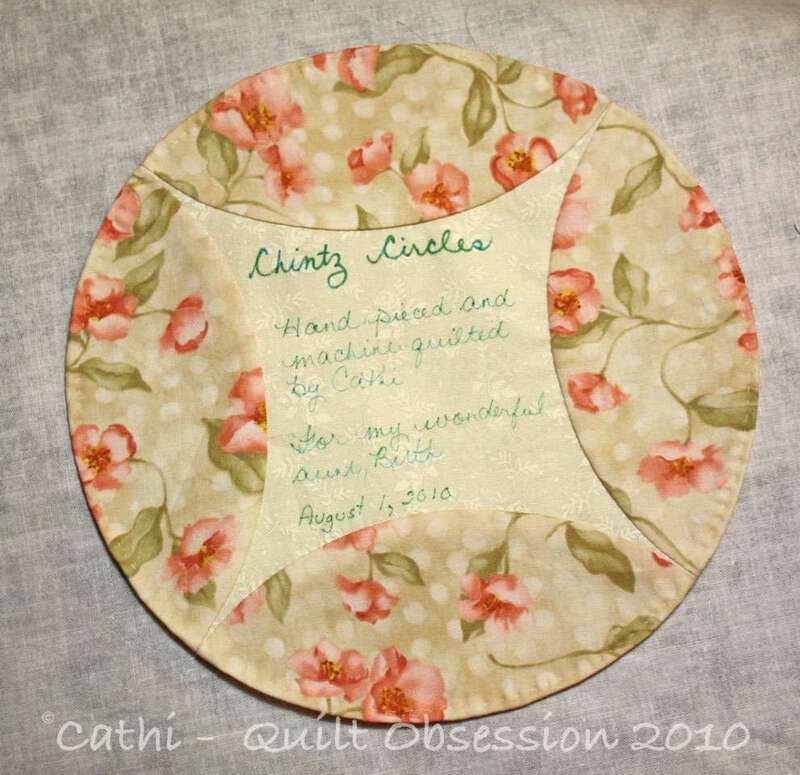 Everything about making Chintz Circles was an absolute joy. 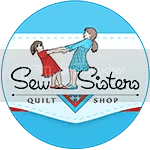 Choosing the fabrics, making the blocks and joining them together, quilting it, even working the thread ends in was fun as I often found myself reflecting on some of the marvelous memories I have of the time I have spent with my aunt over the years. I still find that I quietly laugh to myself when I remember those double solitaire games and the fun we had. 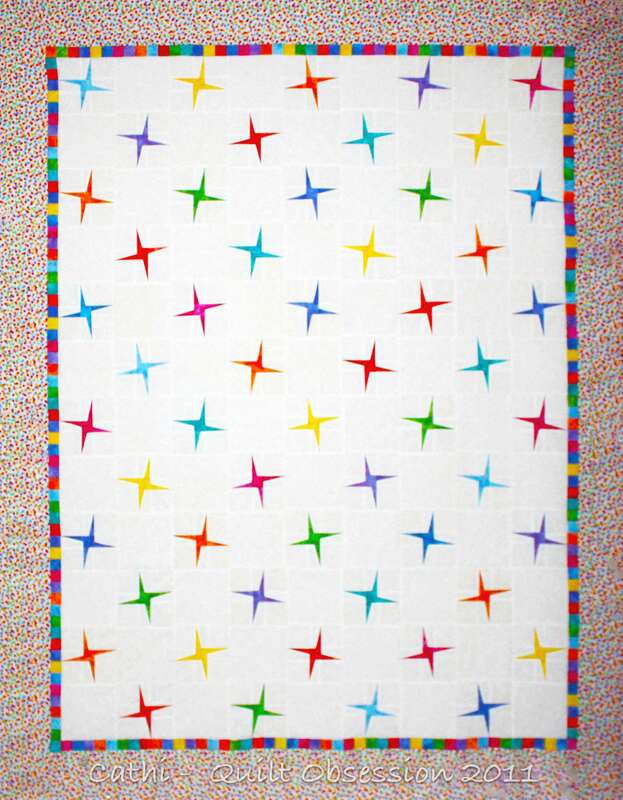 There is no doubt I would have not made this quilt were it not for Linda Franz‘ brilliant invention of Inklingo. Having perfect shapes with stitching lines and matching points turned what may look like a difficult block to piece into something that was an absolute joy to stitch and blocks that went together perfectly every time. 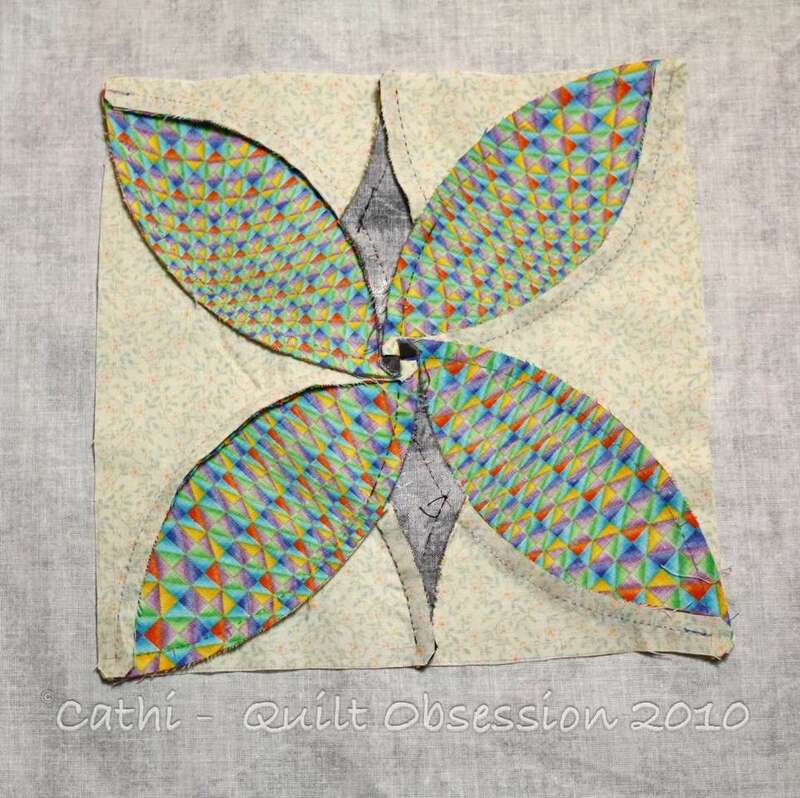 As Chintz Circles is entered in this week’s contest at Quilting Gallery (and you can go vote here), I thought it might be sort of fun to look back at the process of making it. The picture above was taken almost immediately after I finished stitching down the binding but before it was washed. But this is where it began back in late March of this year. I used the Inklingo Orange Peel Deluxe collection to print all the Alabama Beauty shapes on the back of my fabrics, which makes a quilt like this so achievable! No tracing of templates or worrying about matching points on curved seams — they were all there for me. Once I had determined I wanted to get that circle effect, I did have to be careful about my fabric placement. 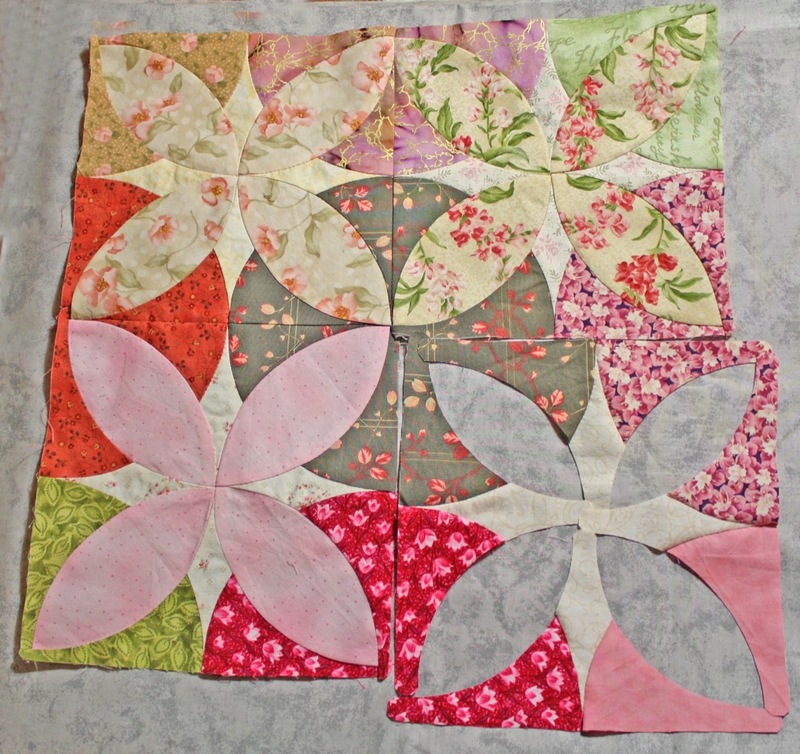 When I got the first four blocks hand pieced by early April and saw the partial circles beginning to appear, I was thrilled. By April 7, 2 complete circles had appeared. By April 12, a total of 6 circles had appeared. By April 21, 2010, there were 9 complete circles. By April 26, a total of 12 circles had shown up. 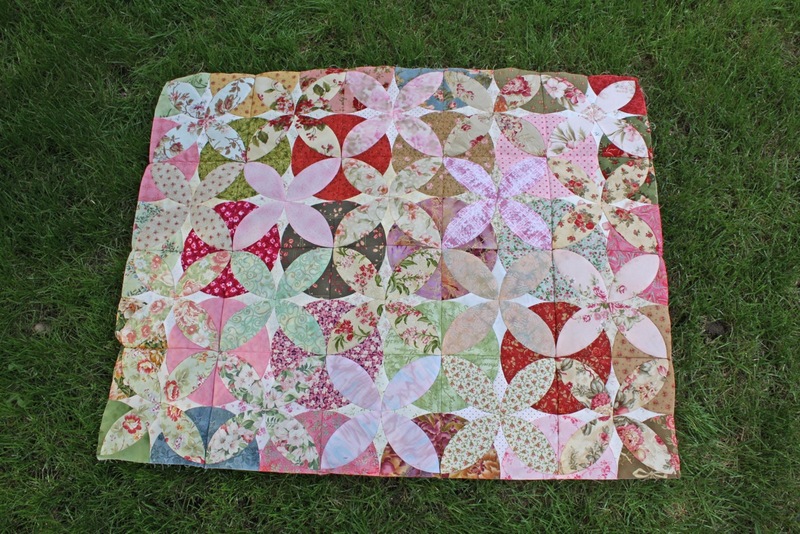 By June 21 a total of 30 circles had appeared, the hand piecing was completed and the top was finished. 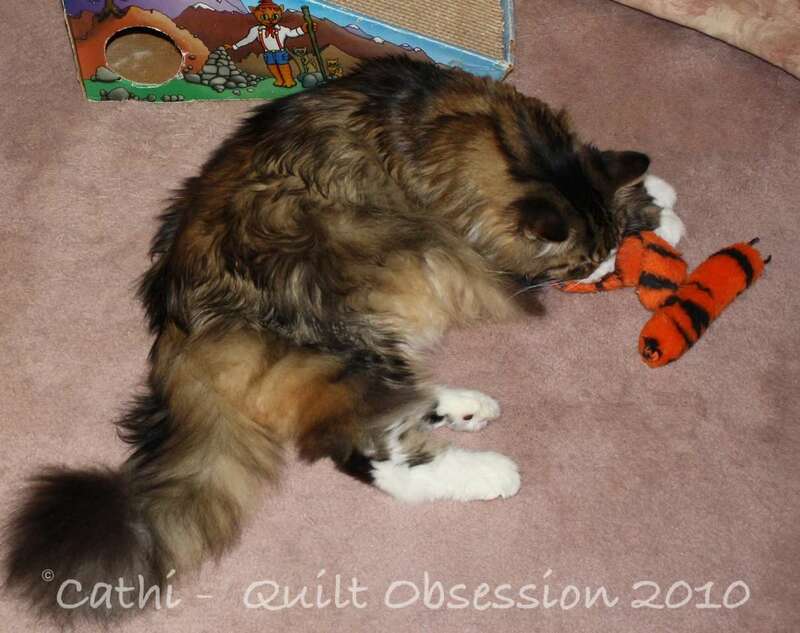 Then the backing was found, the quilt was basted and the machine quilting began. By July 19, I had started tacking down the binding and the next day the picture shown at the top of this post was taken. Then came the best part. 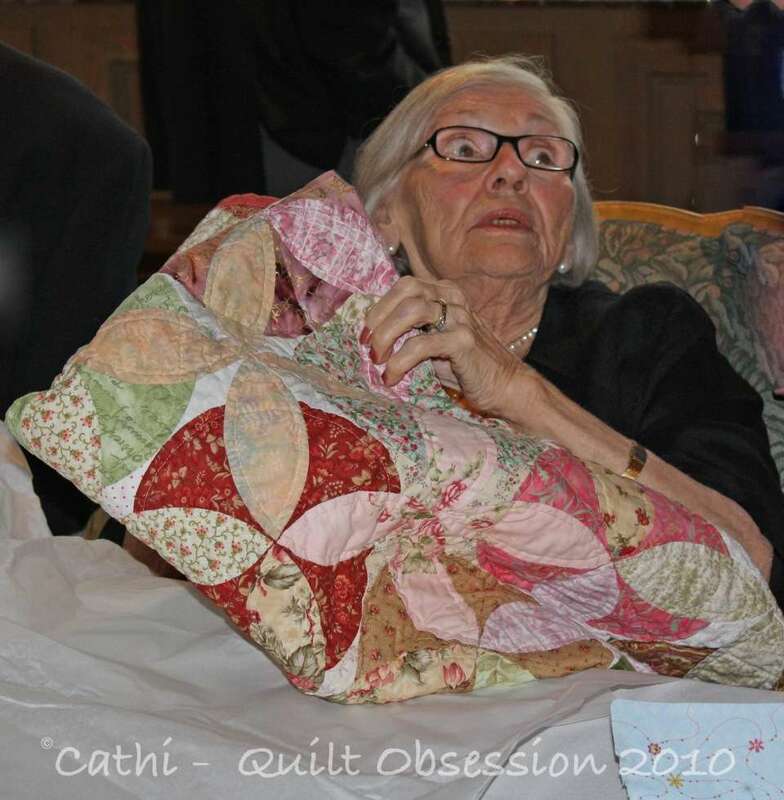 On August 1, 2010 the quilt was presented to my aunt on her 90th birthday. Making Chintz Circles was a true labour of love and I owe thanks to Karen Dianne whose post inspired me to make the circles the predominant feature and to Linda Franz, the inventor of Inklingo, which I think is the best thing to happen in quilting since the rotary cutter and without which I doubt very much that I would have ever made Chintz Circles. 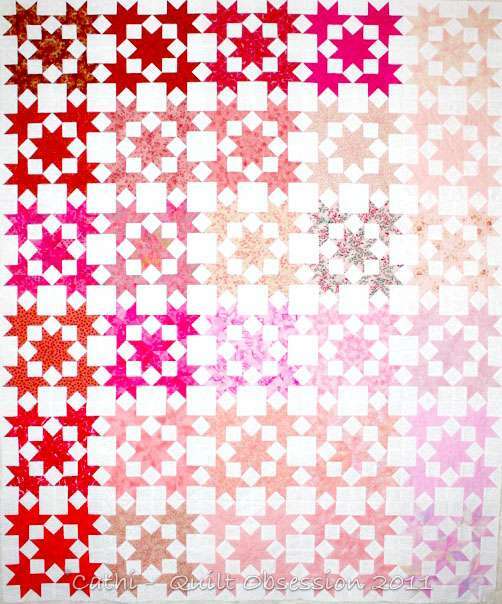 If you’ve stayed with me to the end of this post, please go to Quilting Gallery and vote! You can vote here. Chintz Circles — Please Vote! 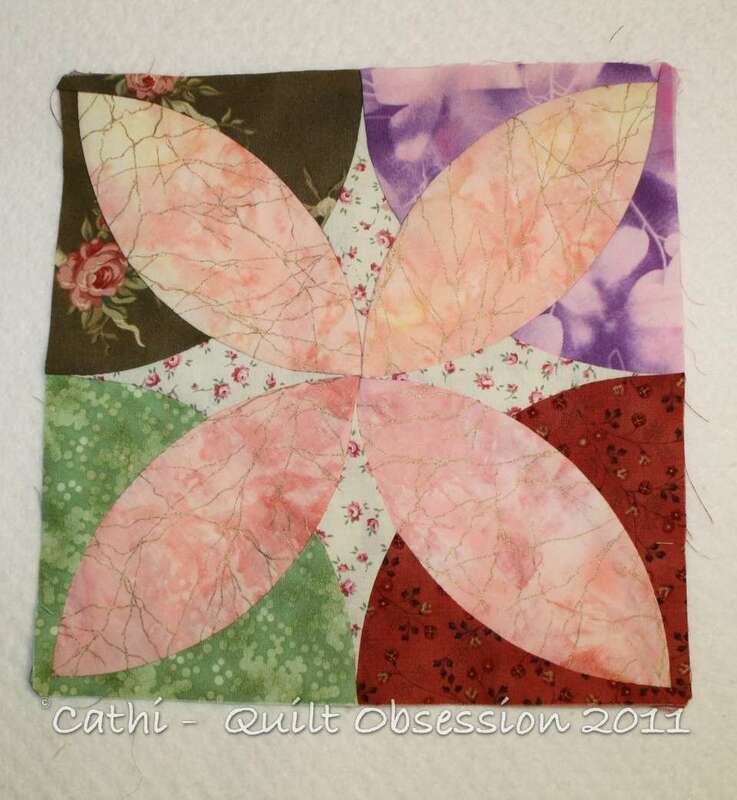 I entered Chintz Circles at Quilt Gallery’s weekly contest as this week the theme is scrappy. 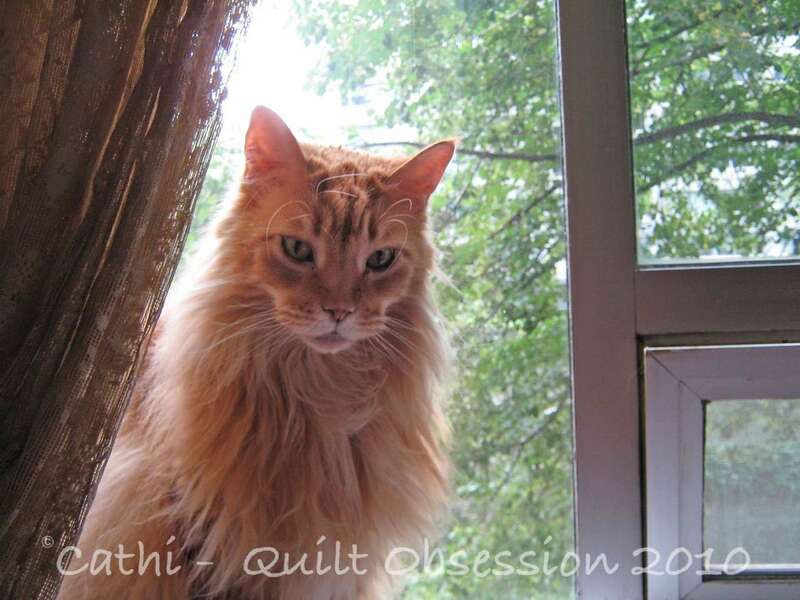 There are some beautiful quilts in this week’s contest which you can view here — the same post where you can vote for your favourite. The photo we took on the roof garden the day I finished Chintz Circles is found here and the post about it being given to my aunt on her 90th birthday is found here. Smudge isn’t too interested. 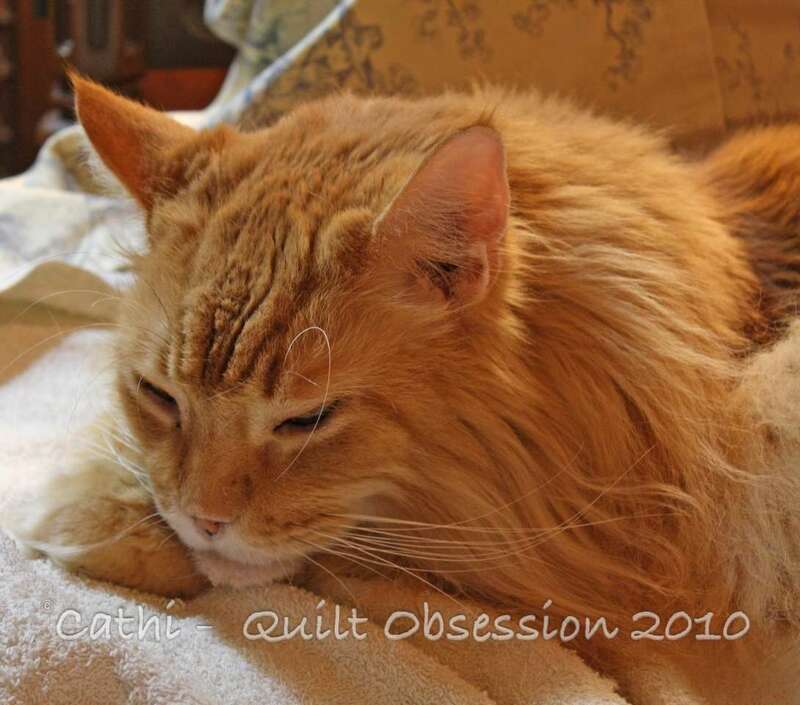 He’d rather have a snooze as the grey chilly days of fall seem to be upon us. Lester also seems to have found himself a nice cozy spot for a nap. 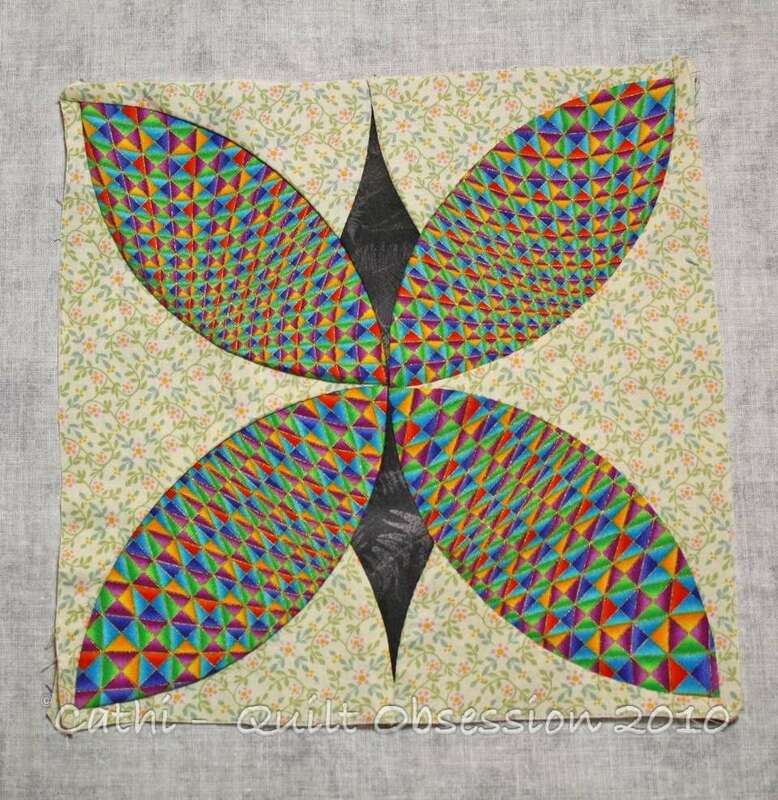 A Butterfly Block or a Dragonfly or? 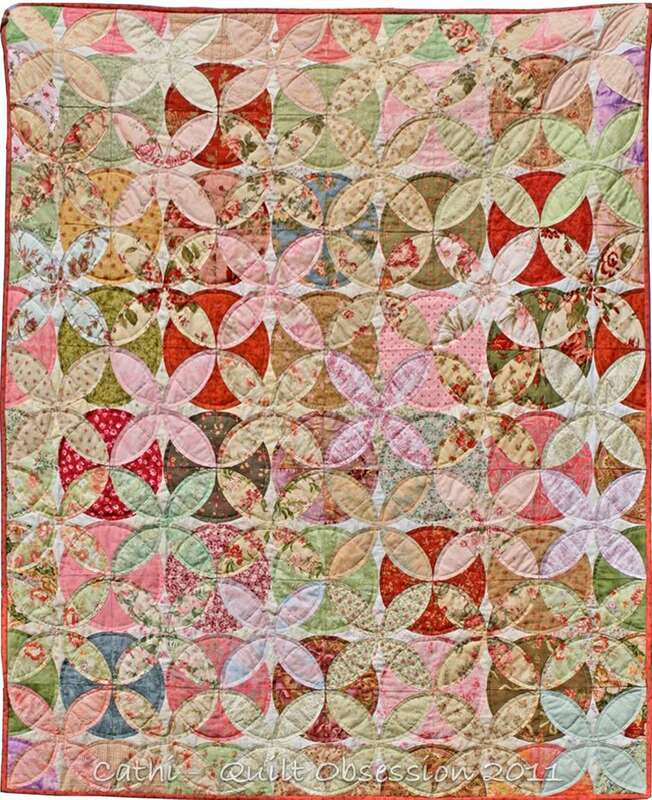 When I saw Karen Dianne’s Alabama Beauty blocks, I saw butterflies. I had to try playing with a bright print for the wings and a black for the body. Mr. Q.O. thinks this looks more like a dragonfly while I’m thinking it’s a butterfly. It was one of those blocks I had to make just to see how it would turn out. I’m not sure how many more butterflies/dragonflies I’ll make, but I think probably at least enough to make a table topper. It makes me laugh as I had decided earlier on the long weekend that I was going to limit myself to working on 4 or 5 projects for a few weeks and not start anything else. Clearly I have limited no self-control when it comes to trying out ideas. Our Thanksgiving weekend was wonderful with great weather, good food and lots of time to just relax. We didn’t go for the standard Thanksgiving weekend drive to look at the foliage and, as very little has turned yet around here, have only a picture of one of the roses from the front garden to show. Much as I do admire the fall colours, I rather like the idea that we still have roses blooming at this time of the year. Smudge spent most of the time the turkey was cooking on Monday in the kitchen. The meowing wasn’t constant, thankfully. But any time either of us walked into the kitchen he was right there, looking up ever so hopefully that there might be something forthcoming. Once the turkey was finished, both he and Lester were in the kitchen waiting for their portions. This was Smudge after his turkey treat. Earlier in the weekend I was rummaging about in the stationery cupboard looking for something. I left the door open for a moment, turned my back and the next thing I knew Lester was in there. We captured this shot as he started to come out after causing a small avalanche of equipment and paper. 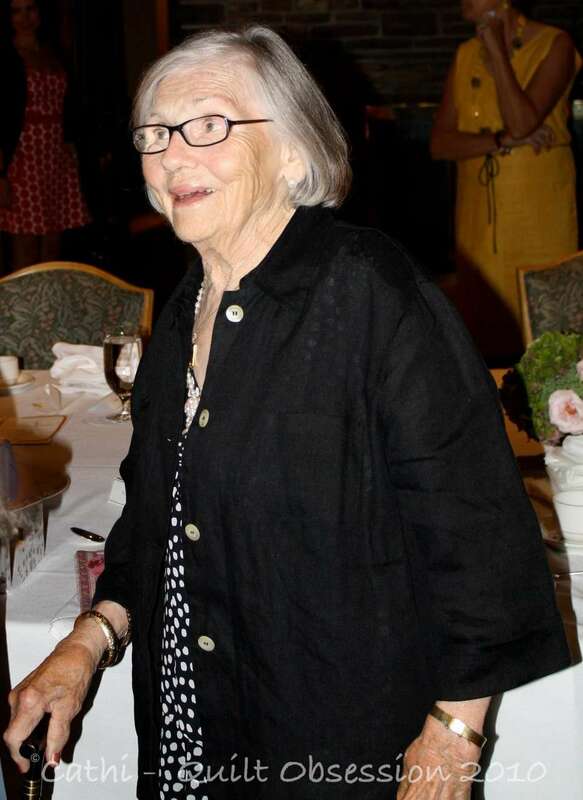 Sunday was the big day, my aunt’s 90th birthday. She is an absolutely amazing lady — sharp as can be and has a fabulous sense of humour. I have the most wonderful memories of playing double solitaire with her at the cottage. The two of us would be laughing like hyenas and my mother, who was always a sports fan, would be trying to listen to a baseball game on the radio. She usually gave up and went out on the porch to listen to her baseball game. 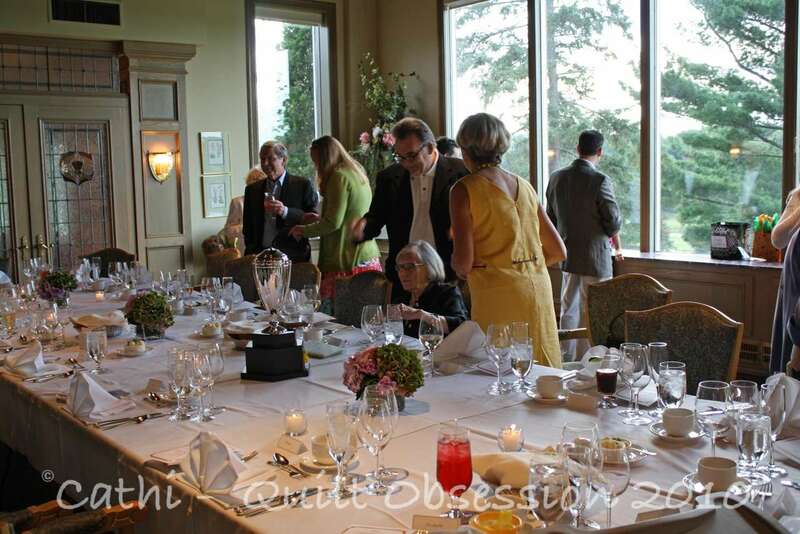 The birthday party was at a golf club. The setting was beautiful. This was the table just before dinner began. My aunt is sitting with her son and daughter standing on either side of her in this picture. Between courses, my aunt was opening gifts. I love the wide-eyed look when she saw her quilt! 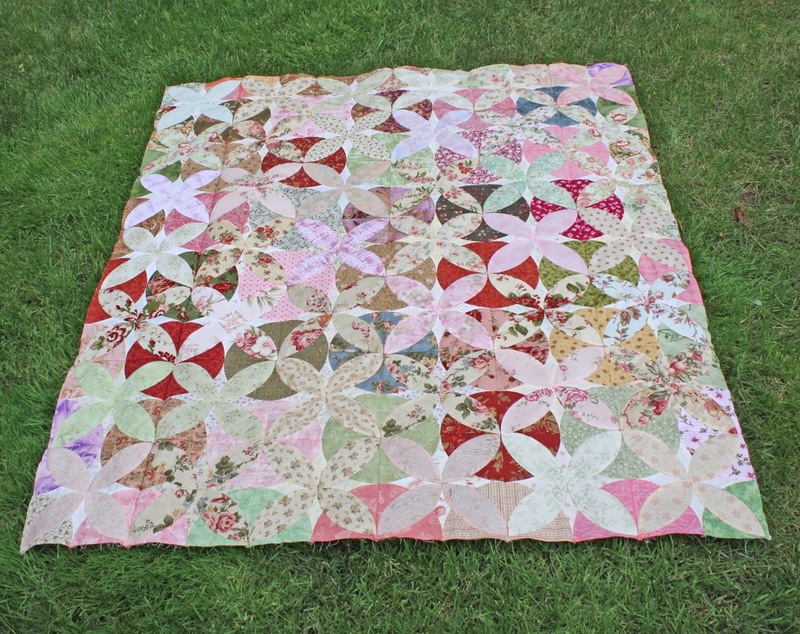 The quilt was washed and dried on Sunday afternoon and it got that wonderful crinkly look. I think if you click on this picture to enlarge it you can see the effect. The best part? I know my aunt will use the quilt. I enjoyed making that quilt and knowing it will be used makes every hand stitch and the fabric wrestling, aka machine quilting, a real labour of love. There was some big news at the party on Sunday. 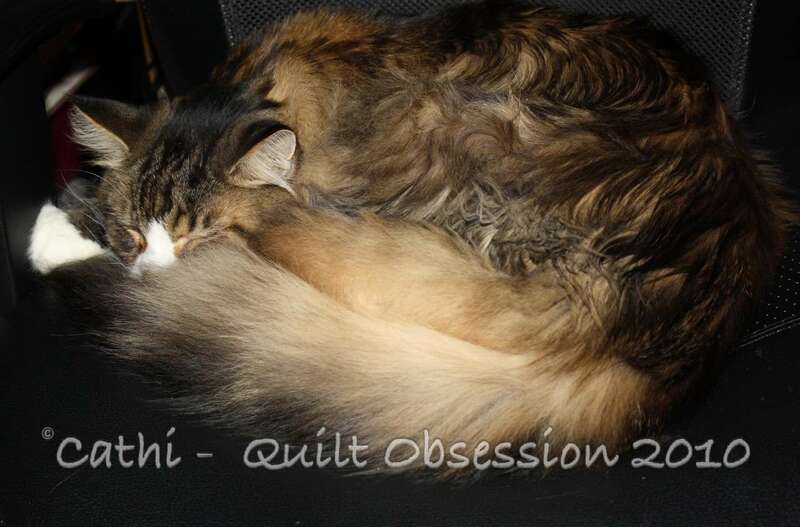 There will be a new addition to the family in February, and I’m planning a quilt now. I’ve got a few ideas floating around in my mind, but no definite plan. 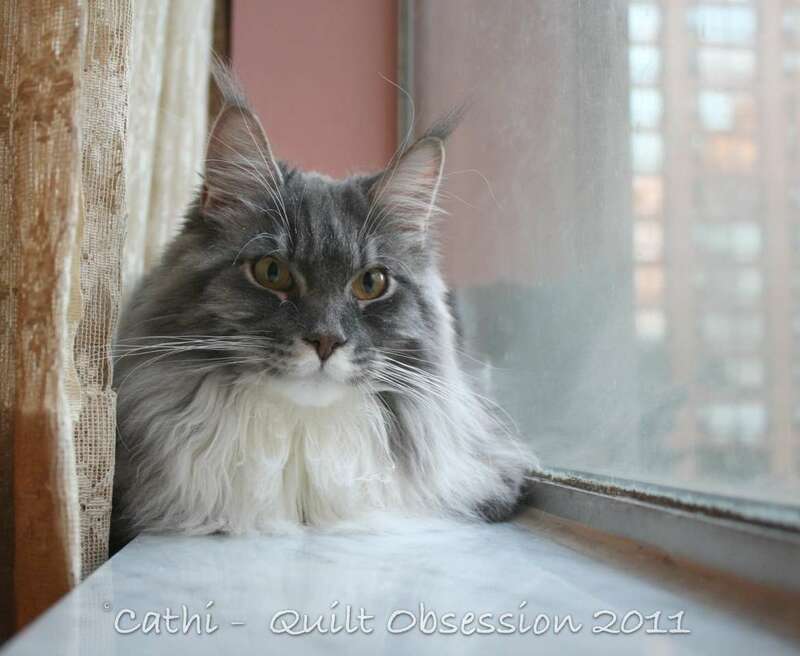 Looking out the window of the dining room, Mr. Q.O. 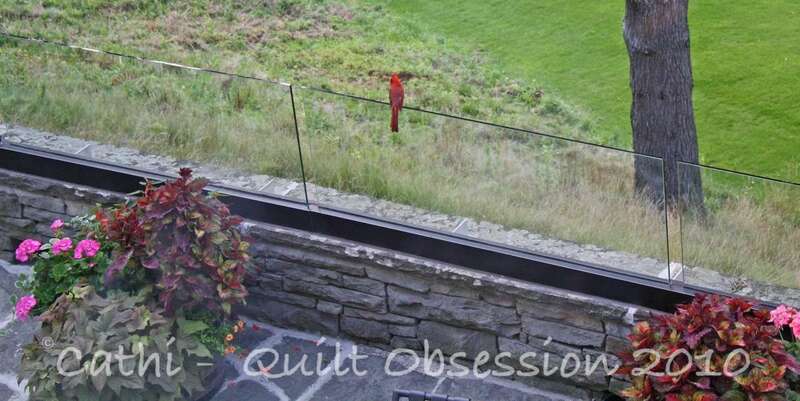 got this shot of a cardinal. My hands/wrists are definitely somewhat better, so starting today I will get caught up on replying to comments and will finally be able to start visiting blogs and leaving comments. Monday is a holiday here in Ontario and we’re about to head back into high heat and humidity. After Saturday, when 70 felt cold, I look forward to the warmth again. Smudge, generally speaking, ignores cat toys. But there is one which he absolutely loves. 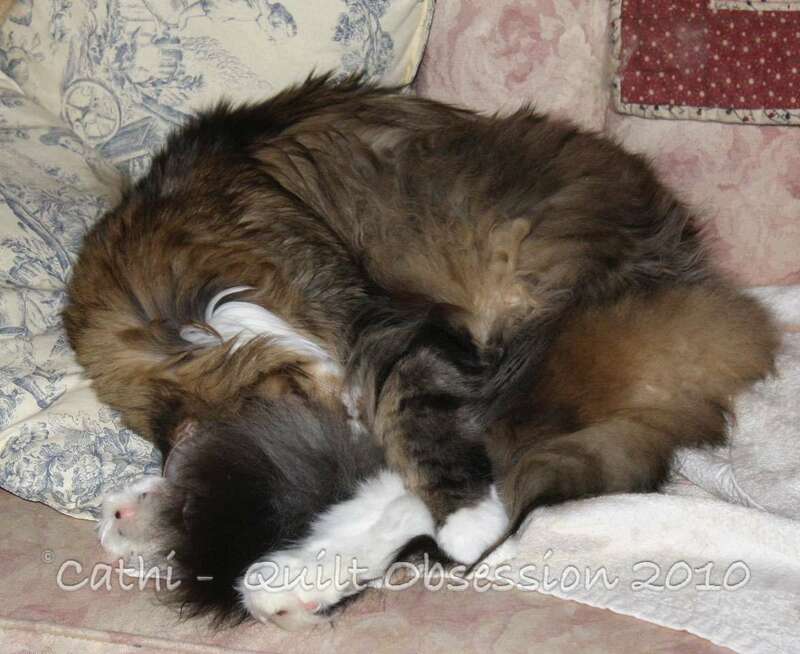 A friend sent the kitties what we call the caterpillar or “Cappy”. They have been playing with one for a few years but it was starting to look pretty worn out so we finally broke out the second one. Every evening Smudge will suddenly start playing with it, so we’ve now dubbed it “Cappy Hour”. The other night he had both the old and new ones. Lester was in his usual windowsill position on the weekend.